This week’s Follow Friday is Mary May, woodcarver extraordinaire and founder of Mary May’s Online School of Woodcarving. We previously featured her in our January 2012 Show Us Your Woodcarving section of Wood News, and she will be teaching a Fundamentals of Woodcarving class this December in our Atlanta store, which you can find more information about and sign-up HERE. We also got the opportunity to learn more about Mary May this past weekend at the Lie-Nielsen Open House in Warren, ME, where she was doing woodcarving demos throughout the weekend, which you can see in the video below. 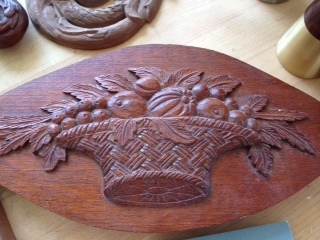 Mary May began woodcarving in 1992 after becoming inspired by all of the intricate carvings she saw in churches, castles, and other old buildings during a trip to Europe. She began studying the craft and working with many different master carvers all around the world in order to learn as much as she could about woodcarving. 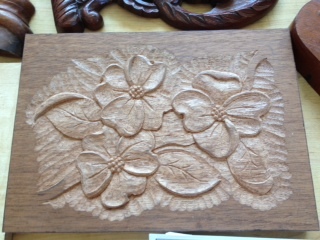 Specifically, she has an interest in traditional furniture and architectural carvings and specializes in carving the details on these pieces. She has her own business dedicated to this craft called Cornerstone Creations, LLC in Charleston, SC, where she currently lives. While in Maine, we talked to Mary about her online school, which is a great way for beginner woodcarvers to become familiar with woodcarving at their own pace. 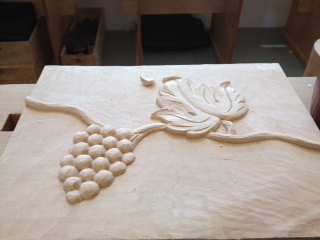 At the moment she has 12 online tutorials for beginning carvers, which are completely free and allow the carver to become familiar with their gouges and other tools, and then carve some simple projects. (Note – you will have to register at her site before you can access the free tutorials.) 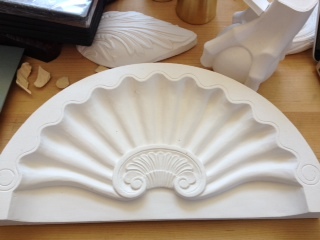 The beginning projects include a Donut, a Simple Flower, and a Camellia Flower seen below in the pictures. Once you get hooked and finish the beginner projects, you can sign up for her monthly pass for $10 a month and have access to the entire library of carving videos, which she updates monthly. As a beginning carver myself, I’m planning to take her online tutorials and will be sharing my experiences in later blogs to come! 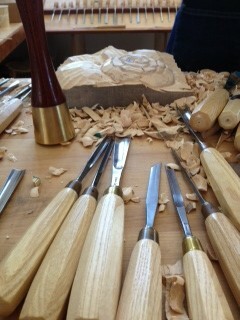 Scroll below pictures of several of the carvings that she was working on during the Lie-Nielsen Open House. You can visit her website HERE to view many more pieces by Mary May. 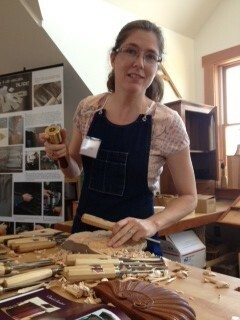 Mallet and multiple carving gouges she used for her pieces. 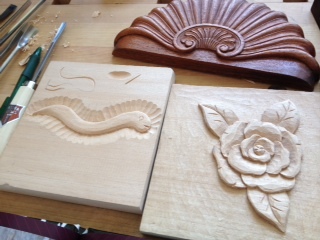 The Worm and Camellia Flower are two of her beginning projects. ———————————————————————————————————————————————————————-Fridays on the Highland Woodworking Blog are dedicated to #FollowFriday, where we use this space to further highlight a woodworker, carver, or turner who we have featured in our monthly e-publications Wood News or The Highland Woodturner. Would you like for your shop or woodworking to appear in our publications? We invite you to SEND US PHOTOS along with captions and a brief history and description of your woodworking or shop (Email photos at 800×600 resolution.) Receive a $50 store credit redeemable towards merchandise if your submission is featured in a future issue.